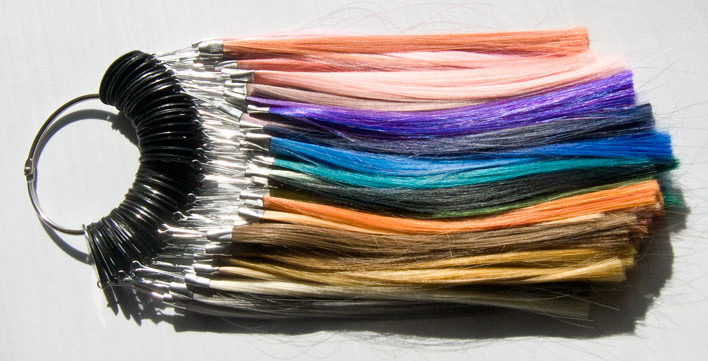 WARPAINT and Unicorns: Arda Wigs Swatch Ring: Swatches & Fiber Review. I've been ordering from Arda for close to 4 years now their wig back when they first launched their store and only had 4 wigs under their line. The biggest selling feature for me at the time was the SIZE. The sport a 23.5" circumference on their wig and a larger overall cap unlike most china line and even most North American lines. I have both a rather large and long head with a 24" circumference. For me, wigs gave me headaches being too tight and forget about wear short style because there was always a ring of my natural hairline showing under the wig. Arda Wigs Color Ring swatches done in natural indirect light for as much colour accuracy as the camera and computer can muster. I've included their C-fiber but this line of shades has been discontinued but I'm leaving the for reference and alternative recommendation. Raspberry CL-006 (AR013): Magenta hot pink and hot pink. Hot Pink CL-007 (AR014): Hot pink with a few strands of Magenta hot pink. Baby Pink CL-014 (163): Cool pink with a few strands of Magenta hot pink and Warm pink. Salmon (203): Mix of 3 pinks and a pumpkin orange shade. Rose Pink CL-009 (033): A mix of 3 pinks from pale to medium tone and white. Princess Pink CL-010 (AR002): A mix of warm pink, cool pink and yellow blonde. Light Pink CL-012 (043): A mix of warm pink, cool pink and yellow blonde. 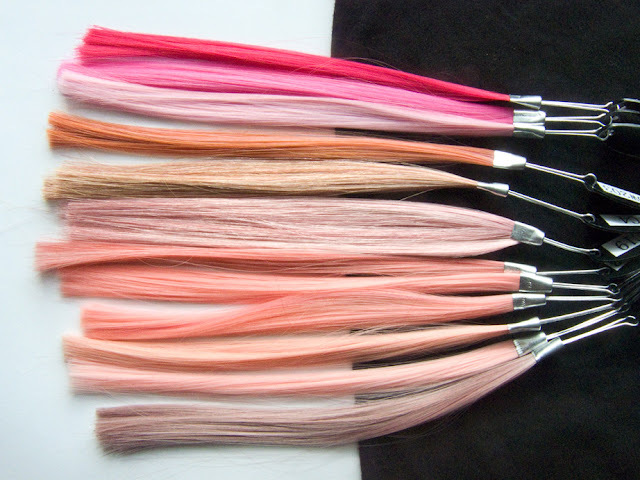 Bubblegum Pink CL-011 (094): A mix of warm pink, ash blonde and white. Dusty Rose CL-017 (135A): A mix of lavender, warm pink, cool pink, and dark lavender. Dark Purple CL-022 (023): Mix of blacken brown (Natural Black), dark violet, and electric purple. Ultraviolet Redux CL-020 (AR020): warm tone purple, and electric purple. Dark Lavender CL-019 (002A): Mix of dark violet, light lavender, pale lilac, and black. Lavender CL-018 (005): Mix of light lavender, pale lilac, and mouse brown. 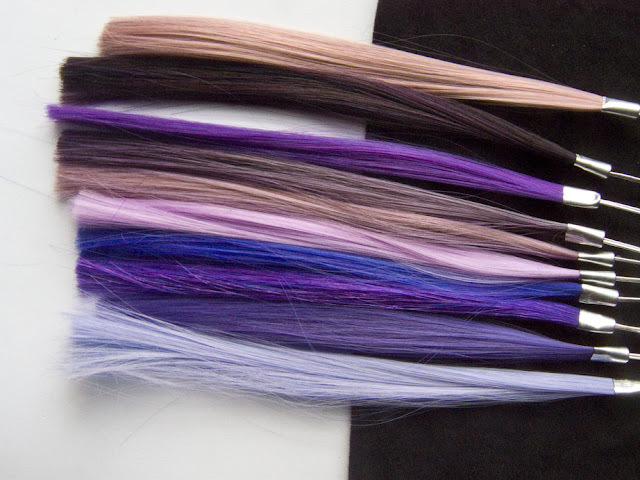 Lilac CL-025 (AR001): Mix of pale lilac, and violet strands. Electric Purple CL-024 (AR004): A mix of dark blue tone purple, warm tone purple, and white. Grape CL-023 (AR003): A mix of cool tone purple, dark blue tone purple, and white. Ice Violet (048): A mix of pale tone purple, cool tone purple, and white. Raven (052): Mix of warm dark blue and black. Dark Blue (092A): Mix of dark blue, Black and white. Charcoal Blue (AR019): Mix of grey, dark blue, black and white. Midnight Blue (073B): Mix of dark blue, teal, and black. Cobalt Blue (AR024): Mix of dark blue, warm blue, and pale blue. Royal Blue (008): Mix of warm blue, dark blue, pale blue, and white. Electric Blue (AR006): Mix of mostly warm blue then dark blue, and white. Slate Blue (010): Mix of pale blue, true blue, and white strands. Aqua (072A): Mix of pale blue, light blue, and white strands. Powder Blue (065): Mix of light blue, and white strands. 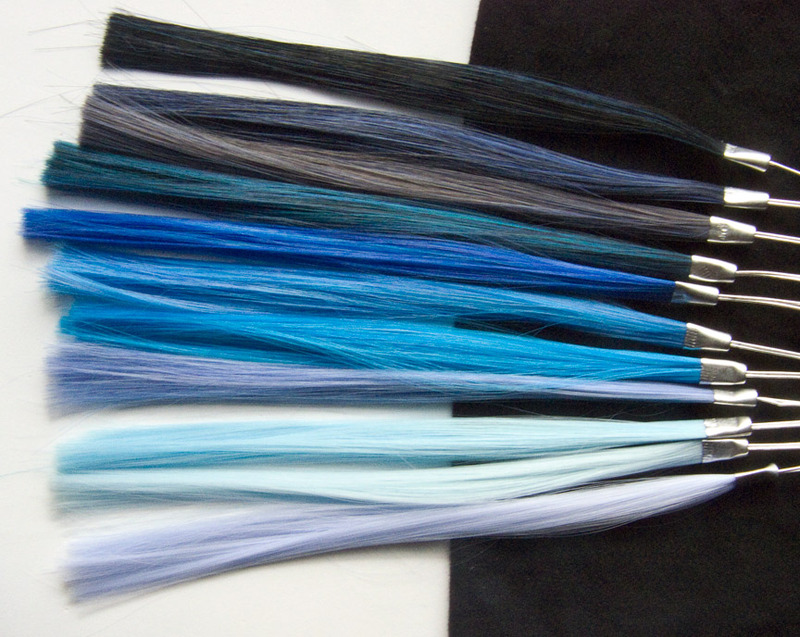 Periwinkle (072B): Mix of true pale blue, and white strands. 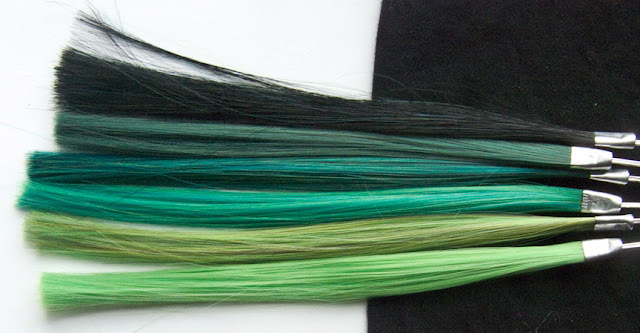 Mako Green (024): Mix of teal, black and white. Ocean Green (AR005): Mix of teal, and white. Teal (011): Mix of teal, pale teal and white. Mint (AR008): a mix of pale blue, pale green and white. Mirkwood Green (AR016): Mix of black, green and lime green. Olive (AR007): Mix of 2 shades of forest green and black. Dark Green (071A): Mix of green, lime green and Black. Emerald Green (084A): Mix of green and lime green. Jade (007A): Mix of lime green, pale yellow, ash blonde and dark brown. Light Green (004): Mix of lime green and ash blonde. Pumpkin (AR011): A mix of three Orange/Ginger tones. Fire Orange (AR023): Mix of red and Sherbet Orange. Light Copper Red (025): Mix of yellow blonde and red. Sherbet Orange (AR010): Mix of orange and blonde. Peach (AR022): Mix of orange, pale pink, yellow blonde, and white. Cherry Red CL-005 (076): Mix of true red and a tiny bit of yellow. Apple Red CL-004 (AR012): Mix of cool red and white. Maroon CL-002 (018): Mix of dark red maroon, cool red and ash blond. Dark Copper Red (015): Mix of natural henna red, brown and ash blond. Dark Brown (056): Mix of warm and cool dark browns with a dash of blanked brown. Mahogany (104): Mix of cool dark browns almost in the red tones. Spanish Brown (050): Mix of mid-tone and dark browns. Chocolate (AR021): Mix of mid-tone warm browns with a few henna tones. Light Brown (AR018): Mix of mouse browns. Warm Light Brown (AR015): Mix of light warm henna browns. Sandy Brown (124): Mix of light browns and ash blond. Ginger Blonde (027): Mix of warm blonde, light brown blonde with a dash of yellow. 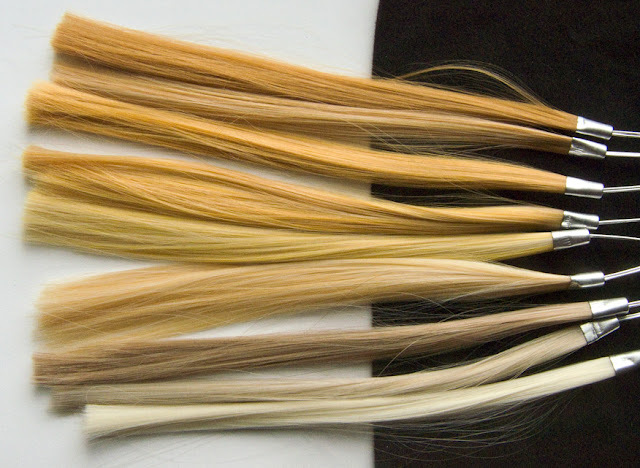 Pale Blonde (115): Mix of warm blonde, ash blonde with a dash of yellow. Yellow Blonde (079): Mix of warm blonde, light blonde with a dash of yellow. Light Blonde (013): Mix of light blonde, warm blonde with a dash of yellow. Lemon (095): Mix of ash blonde, light blonde, yellow, with a dash of warm blonde. 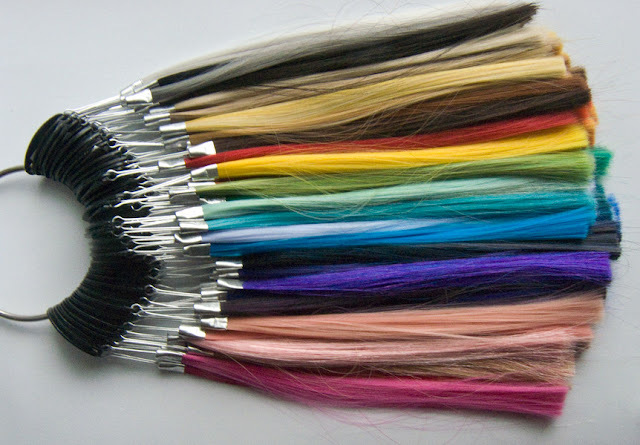 Platinum Blonde (081): Mix of titanium blonde, light blonde, with a dash of yellow. Dark Ash Blonde (029): Mix of dark ash blonde, ash blonde, brown with a dash of titanium blonde. Titanium Blonde (AR017): Palest blonde and white. Natural Black (080): Just pure blackened Brown. Black (064): Just pure black. Grey (087): Mix of dark grey, and true grey. Light Grey (107): True grey. 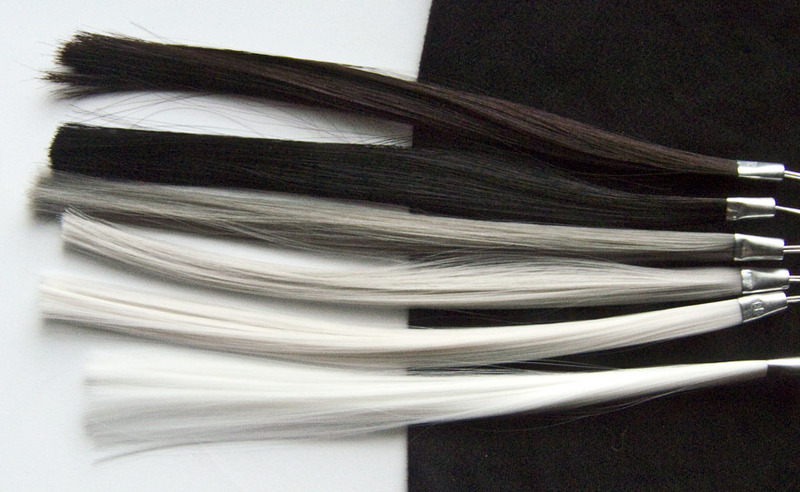 Silver (063): Mix of light silver grey and white strands. Pure White (F18): Just pure white. The wig shade blends are Hiperlon based. Very subtle sheen. Hiperlon based wigs don't take well to alcohol based dyes, I've tried this twice as well and the dye would rub/wash off completely. From personal experience boiled fabric dye baths do work to achieve 40% of the original colour as a tint and others have had luck airbrushing with Liquitex Liquid Acrylics. 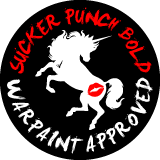 In the same vein, you should be able to get the same results with FW acrylic inks but I have not tried this myself yet. I'll be doing a review on the wigs themselves latter as I got a number of them in the past 3 years with the Hiperlon fiber as the base. If you like to purchase your supplied from Ard Wigs (with international options) or Arda Wigs Canada. Thank you SO much for posting this review! I'm thinking of buying from Arda but I was wondering if you think black or natural black would be the best color to get if I wanted to get, say the odango buns to match my typical undyed, dark Asian hair? Thanks! Thanks so much. I just wanted to order the wig for Bordercoss and I was going to go for platinum blonde but dark ash blonde is so much better. Do you think i could combine and platinum blonde with a dark ash blonde wig? The Arwen looks a bit thin. Oww, they don't have the Arwen in dark ash blonde. I was thinking of buying two wigs since the Arwen looks a bit thing. Do you think it would work to combine a platinum blonde and a dark ash blonde wig? What character are you trying to go for? As to combining, unless you layer the wefts in the wig to alternate colour rows in most wigs you will see a stricking colour difference if you just stack the two shade together. Thanks a lot, I found all the missing color names here! um what do you think would be the best blonde for a Nagisa Hazuki wig? I'm looking mainly at the "Jett" wig, and the "Hansel" wigs, so if the color you recommend is out of stock, or not available, you could give me the closest shade or other similar wig. I feel like Light Blonde (013) would fit it golden tone best in the show. Second choice would be Lemon (095). Hello! First off I want to thank you for posting this review! It helps make choosing colors a little bit easier! I've already chosen a natural black Marty wig for the base, the main issue I'm having is choosing the right color for the portion of bleached hair he has in the front. In the anime, it appears more Light Pale Brown, but I'm looking to go towards more pale blondish brown so it'll stand out a bit more. 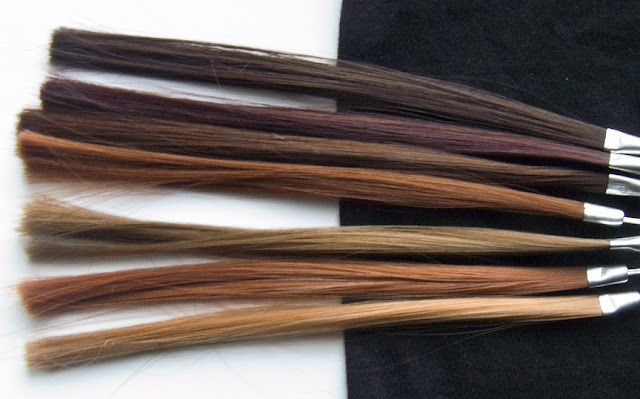 Right now it's a toss up between Sandy Brown, Pale blond, and Dark Ash Brown. I like Sandy Brown (124) because it's got a bit of warmth to it with blonde hair mixed in and will stand out better colour wise against the black. This is a really late comment sorry! Im having the worst time trying to figure out if any of these blondes will work for the cosplay im going to do which is a female Tsukishima Kei from Haikyuu. (reference link: http://pre08.deviantart.net/8379/th/pre/f/2016/083/7/0/tsukishima_kei_x_reader_why_are_you_so_angry__by_kagamiaoi-d9wal0m.png) All of them seem too yellow or too cool toned and im at a loss. My pick would still be the Platinum Blonde (081). You have to remember most anime character skin tone are even paler than most Caucasian as well. The shade of his hair is a warm gold rather thank yellow that read more like a natural blonde. If your really concerned you could also dye the Ash Blonde (062) shade as well with a golden rod yellow fabric dye to tint it warmer.